In addition to the tasks often performed by users in Section 50.1, “End User Control of SELinux”, SELinux administrators could be expected to perform a number of additional tasks. These tasks typically require root access to the system. Such tasks are significantly easier under the targeted policy. For example, there is no need to consider adding, editing, or deleting Linux users from the SELinux users, nor do you need to consider roles. This section covers the types of tasks required of an administrator who maintains Red Hat Enterprise Linux running SELinux. You may never need to relabel an entire file system. This usually occurs only when labeling a file system for SELinux for the first time, or when switching between different types of policy, such as changing from the targeted to the strict policy. The recommended method for relabeling a file system is to reboot the machine. This allows the init process to perform the relabeling, ensuring that applications have the correct labels when they are started and that they are started in the right order. If you relabel a file system without rebooting, some processes may continue running with an incorrect context. Manually ensuring that all the daemons are restarted and running in the correct context can be difficult. Use the following procedure to relabel a file system using this method. At boot time, init.rc checks for the existence of /.autorelabel. If this file exists, SELinux performs a complete file system relabel (using the /sbin/fixfiles -f -F relabel command), and then deletes /.autorelabel. Using fixfiles to restore contexts from packages is safer and quicker. Running fixfiles on the entire file system without rebooting may make the system unstable. If the relabeling operation applies a new policy that is different from the policy that was in place when the system booted, existing processes may be running in incorrect and insecure domains. For example, a process could be in a domain that is not an allowed transition for that process in the new policy, granting unexpected permissions to that process alone. In addition, one of the options to fixfiles relabel prompts for approval to empty /tmp/ because it is not possible to reliably relabel /tmp/. Since fixfiles is run as root, temporary files that applications are relying upon are erased. This could make the system unstable or behave unexpectedly. In Red Hat Enterprise Linux 5, most targeted daemons do not interact with user data and are not affected by NFS-mounted home directories. One exception is the Apache HTTP Server. For example, CGI scripts that are on the mounted file system have the nfs_t type, which is not a type that httpd_t is allowed to execute. Section 50.2.9, “Specifying the Security Context of Entire File Systems” explains how to mount a directory so that httpd can execute scripts. If you do this for user home directories, it gives the Apache HTTP Server increased access to those directories. Remember that a mountpoint label applies to the entire mounted file system. Future versions of the SELinux policy address the functionality of NFS. Similar to standard Linux DAC permissions, a targeted daemon must have SELinux permissions to be able to descend the directory tree. This does not mean that a directory and its contents need to have the same type. There are many types, such as root_t, tmp_t, and usr_t that grant read access for a directory. These types are suitable for directories that do not contain any confidential information, and that you want to be widely readable. They could also be used for a parent directory of more secured directories with different contexts. If you are working with an avc: denied message, there are some common problems that arise with directory traversal. For example, many programs run a command equivalent to ls -l / that is not necessary to their operation but generates a denial message in the logs. For this you need to create a dontaudit rule in your local.te file. When trying to interpret AVC denial messages, do not be misled by the path=/ component. This path is not related to the label for the root file system, /. It is actually relative to the root of the file system on the device node. For example, if your /var/ directory is located on an LVM (Logical Volume Management ) device, /dev/dm-0, the device node is identified in the message as dev=dm-0. When you see path=/ in this example, that is the top level of the LVM device dm-0, not necessarily the same as the root file system designation /. Refer to the explanation in Section 50.1.4, “Creating Archives That Retain Security Contexts”. You can enable and disable SELinux enforcement at runtime or configure it to start in the correct mode at boot time, using the command line or GUI. SELinux can operate in one of three modes: disabled , meaning not enabled in the kernel; permissive , meaning SELinux is running and logging but not controlling permissions; or enforcing , meaning SELinux is running and enforcing policy. Use the setenforce command to change between permissive and enforcing modes at runtime. Use setenforce 0 to enter permissive mode; use setenforce 1 to enter enforcing mode. You can also disable enforcing mode for a single daemon. For example, if you are trying to troubleshoot the named daemon and SELinux, you can turn off enforcing for just that daemon. This sets the runtime value only. Use the -P option to make the change persistent across reboots. Any *_disable_trans booleans that are set to "on" invoke the conditional that prevents the process from transitioning to the domain on execution. You can configure all of these settings using system-config-selinux. The same configuration files are used, so changes appear bidirectionally. Use the following procedure to change a runtime boolean using the GUI. Administrator privileges are required to perform this procedure. On the System menu, point to Administration and then click Security Level and Firewall to display the Security Level Configuration dialog box. 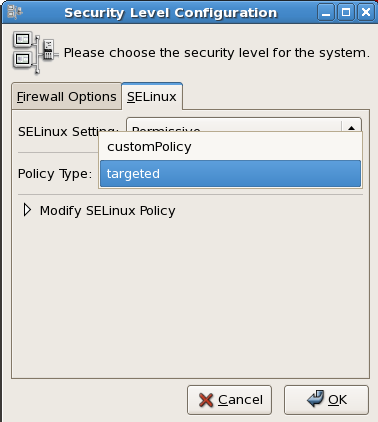 Click the SELinux tab, and then click Modify SELinux Policy. In the selection list, click the arrow next to the Name Service entry, and select the Disable SELinux protection for named daemon check box. Click OK to apply the change. Note that it may take a short time for the policy to be reloaded. Figure 50.1. Using the Security Level Configuration dialog box to change a runtime boolean. If you want to control these settings with scripts, you can use the setenforce(1), getenforce(1), and selinuxenabled(1) commands. Changes you make to files while SELinux is disabled may give them an unexpected security label, and new files will not have a label. You may need to relabel part or all of the file system after re-enabling SELinux. From the command line, you can edit the /etc/sysconfig/selinux file. This file is a symlink to /etc/selinux/config. The configuration file is self-explanatory. Changing the value of SELINUX or SELINUXTYPE changes the state of SELinux and the name of the policy to be used the next time the system boots. Use the following procedure to change the mode of SELinux using the GUI. You need administrator privileges to perform this procedure. In the SELinux Setting select either Disabled, Enforcing or Permissive, and then click OK. If you changed from Enabled to Disabled or vice versa, you need to restart the machine for the change to take effect. Changes made using this dialog box are immediately reflected in /etc/sysconfig/selinux. This section provides a brief introduction to using customized policies on your system. A full discussion of this topic is beyond the scope of this document. Ensure that the complete directory structure for the required policy exists under /etc/selinux. In the Policy Type list, select the policy that you want to load, and then click OK. This list is only visible if more than one policy is installed. Restart the machine for the change to take effect. Figure 50.2. Using the Security Level Configuration dialog box to load a custom policy. You can use the mount -o context= command to set a single context for an entire file system. This might be a file system that is already mounted and that supports xattrs, or a network file system that obtains a genfs label such as cifs_t or nfs_t. When troubleshooting httpd and SELinux problems, reduce the complexity of your situation. For example, if you have the file system mounted at /mnt and then symbolically linked to /var/www/html/foo, you have two security contexts to be concerned with. Because one security context is of the object class file and the other of type lnk_file, they are treated differently by the policy and unexpected behavior may occur. Refer to Section 49.5.5, “Assigning Categories to Files” and Section 49.5.4, “Assigning Categories to Users” for information about adding and changing the security categories of files and users. You can use the runcon command to run a command in a specific context. This is useful for scripting or for testing policy, but care should be taken to ensure that it is implemented correctly. This command returns the enforcing status of SELinux. This command controls the enforcing mode of SELinux. 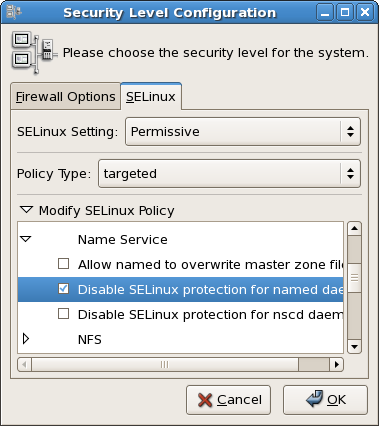 The option 1 or Enforcing tells SELinux to enter enforcing mode. The option 0 or Permissive tells SELinux to enter passive mode. Access violations are still logged, but not prevented. This command exits with a status of 0 if SELinux is enabled, and 1 if SELinux is disabled. This command shows the status of all booleans (-a) or a specific boolean (<boolean_name>). This command sets one or more boolean values. The -P option makes the changes persistent across reboots. This command toggles the setting of one or more booleans. This effects boolean settings in memory only; changes are not persistent across reboots. You use the newrole command to run a new shell with the specified type and/or role. Changing roles is typically only meaningful in the strict policy; the targeted policy is generally restricted to a single role. Changing types may be useful for testing, validation, and development purposes. The ARGS are passed directly to the shell specified in the user's entry in the /etc/passwd file. The newrole command is part of the policycoreutils-newrole package, which is required if you install the strict or MLS policy. It is not installed by default in Red Hat Enterprise Linux. The primary reason for rebooting the system from an SELinux perspective is to completely relabel the file system. On occasion you might need to reboot the system to enable or disable SELinux. LVM is the grouping of physical storage into virtual pools that are partitioned into logical volumes.